The expansion of global aquaculture is on a tear and will surely make fish products readily available to everyone over the next generation. The wild fishery has to also organize itself far better. In fact the best you can say about every part of the fish industry is that it all needs to do better. The good news is that it is doing so. In fact I have little doubt two centuries from now that the global fishery will be many times bigger and that wild stocks will be the greatest ever known. Our problem and the ongoing problem is simply the steps to get there. The difficulty today is that we are pioneering a period of rapid change to allow access for all to seafood. I am sure that we will all soon get to eat nile perch. Fish now accounts for almost 17 percent of the global population’s intake of protein. 19 May 2014, Rome – More people than ever before rely on fisheries and aquaculture for food and as a source of income, but harmful practices and poor management threaten the sector’s sustainability, says a new FAO report published today. According to the latest edition of FAO’s The State of World Fisheries and Aquaculture, global fisheries and aquaculture production totalled 158 million tonnes in 2012 - around 10 million tonnes more than 2010. At the same time, the planet's oceans – if sustainably managed – have an important role to play in providing jobs and feeding the world, according to FAO's report. The new report also says fish now accounts for almost 17 percent of the global population’s intake of protein -- in some coastal and island countries it can top 70 percent. 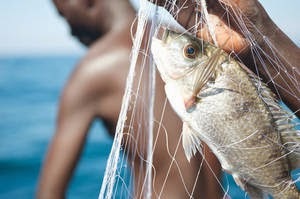 FAO estimates that fisheries and aquaculture support the livelihoods of 10–12 percent of the world’s population. The role of fish is set to feature prominently at the Second International Conference on Nutrition jointly organized by FAO and the World Health Organization (WHO) for 19–21 November 2014 in Rome. An estimated 1.3 billion tonnes of food are lost per year -- to about one-third of all food produced. This figure includes post-harvest fish losses, which tend to be greater in small-scale fisheries. Food chain traceability is increasingly a requirement in major fish markets, especially in the wake of recent scandals involving the mislabelling of food products. FAO provides technical guidelines on certification and ecolabelling which can help producers demonstrate that fish has been caught legally from a sustainably managed fishery or produced in properly run aquaculture facility. In particular, the report stresses the importance of the Code of Conduct for Responsible Fisheries which, since its adoption almost two decades ago, remains key to achieving sustainable fisheries and aquaculture. The Code promotes the responsible use of aquatic resources and habitat conservation to help boost the sector’s contribution to food security, poverty alleviation and human well-being.